pay the crook behind it some specified amount of money, at which point you MIGHT get everything back. With word coming out recently that new, more powerful ransomware may be hitting the scene in the not-too-distant future, I thought it would be a good idea to talk a bit about how ransomware works and how you can protect yourself. Ransomware can infect your computer in most of the traditional ways (opening infected email attachments, following links to bad sites, malicious ads on legitimate sites, infected flash drives, and so on), and can block you from using your computer in two ways. antivirus/anti-malware, but will also block access to all your files by encrypting them. encryption that it cannot feasibly be cracked with current computer technology, so since the people trying to rob you are the only ones with the decryption key, Cryptolocker can really leave you up the creek. Though it wasn’t ransomware, the Heartbleed bug was revealed to be a major security vulnerability earlier this year. Here’s a blog about how to protect yourself from the Heartbleed security flaw. Some types of ransomware are up front about the fact that they’re robbing you, and others aren’t. The ones that come right out and tell you that your files are being held hostage (again, Cryptolocker is the most well-known example) pop up a window telling you that all your files are encrypted, and the only way you can get them decrypted is to pay the attacker a specified sum of money. You are usually given a set period of time to pay the ransom before your files are permanently destroyed, and are also warned that trying to remove the software will also result in the destruction of your data. 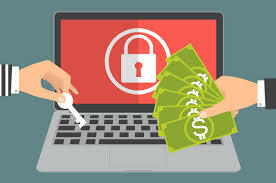 Other types of ransomware have a more deceptive approach that uses scare tactics to get you to fork over the cash, and is actually called scareware by information security professionals. One flavor of scareware that’s been around for years is the “fake antivirus” that pops up on screen saying that it’s detected some large number of dangerous viruses on your computer and, “for your protection”, has blocked your access to the internet until you pay to download and run their fabulous antivirus software. The only virus causing you a problem at this point is the one blocking your internet access while claiming to be on your side, but since you can’t access the internet to find out more, or even run your antivirus or anti-malware in a lot of cases, a lot of people accept it at face value. The first rule you should always follow if you get hit by a ransomware attack is that you shouldn’t pay the ransom under any circumstances. Remember, you’re dealing with criminals here, ones that are probably overseas in a country where it’s easy to get away with this kind of thing, and there is absolutely no guarantee that paying the ransom will make the problem go away. Unfortunately, there’s not much you can do if you’re already infected with ransomware. Probably your best option at this point would be to boot Windows into Safe Mode and try to fix the problem from there, and here’s a link to a video from Norton on how to do that. They’re obviously going to recommend their own malware removal tool, there are others you can try, but it describes the general process of getting into Safe Mode and trying to remove the ransomware, which is the important part. Good enough, thanks for the exposure to such a vital information.